Bristol Motor Speedway officials hit the road Tuesday to promote the upcoming Food City 500 weekend by hosting a media luncheon in Knoxville and making a special visit to Bridgestone Arena in Nashville, where it was "Bristol Motor Speedway Night" at the Predators sponsored by Fitzgerald USA. Several top NASCAR drivers including Brad Keselowski, Daniel Hemric, Austin Cindric, Chad Finchum and NHRA driver Alex Laughlin participated during the day of fun across the state of Tennessee. Second-year XFINITY Series star Hemric, who drives the No. 21 South Point Hotel and Casino Chevy Camaro for Richard Childress Racing, and XFINITY Series rookie Finchum, a Knoxville native, kicked off the day by meeting with media at Calhoun's in Knoxville. Finchum shared some breaking news with the assembled journalists when he announced he would be making his Monster Energy NASCAR Cup Series debut driving the No. 66 Toyota for MBM Motorsports at the Food City 500 on Sunday, April 15. "It's going to be 800 miles for me during that weekend, but it's worth it," Finchum said. "We plan to hit it hard at Bristol. We've won there before (K&N Series, April 2016) so we have a lot of confidence going there. It's my home track and I am comfortable in short track racing so I hope I can take advantage of this opportunity." Finchum will be pulling double duty at The Last Great Colosseum. He will also race in Saturday's Fitzgerald Glider Kits 300 XFINITY Series event driving the No. 40 Toyota for MBM. "That track is just so special to me," said Finchum. "I can't think of a track where I would rather make my Cup debut. It just feels like home to me." Hemric, who is also slated to compete in two Cup races later this season driving the iconic No. 8 for Richard Childress Racing, said he enjoys racing on Bristol's high banks. He had good success in his 2017 XFINITY starts at Bristol, finishing 5th in April and 7th in August. "Bristol's a place I love going to every year," Hemric said. "It's got its own feel of electricity with the crowd looking down on you. You just feel like a gladiator." Hemric traveled on to Nashville in the BMS caravan and was joined in Smashville by Cup driver Brad Keselowski, fellow XFINITY driver Austin Cindric and NHRA Pro Stock driver Alex Laughlin for "Bristol Motor Speedway" Night at the Nashville Predators sponsored by Fitzgerald USA, where the Preds took on the Minnesota Wild. The drivers, who were presented custom Predators jerseys with their names and respective racing numbers on the back, participated in pre-game activities, waved rally towels to help start the game and greeted fans during an autograph session during the second intermission. Cindric, who splits time in the No. 22 Ford Mustang for Penske Racing and the No. 60 Ford Mustang for Roush Fenway Racing in the XFINITY Series, participated in an on-ice tri-cycle race during the first intermission and smoked his competition. Hemric, who is a huge fan of all sports, had a blast during his Predators experience. "It's really cool anytime you can come to a place that you don't get to visit that often like Nashville and check it out," Hemric said. "When you can work in a sports event that's as cool as the Predators then that makes it even better. I just really enjoy the vibe that you get in Nashville. It's an awesome town." Keselowski, who drives the No. 2 Ford Fusion for Penske Racing and has two career victories at Bristol, was interviewed at the FOX Sports Tennessee news desk near the ice by announcers Lyndsay Rowley and Terry Crisp prior to the game. "Growing up and being a part of NASCAR is a dream come true," he told them. "Bristol is a track that's really exciting. We've had some success there, I've won there twice and I'm looking forward to going back there in a couple of weeks." Keselowski later told local media members there about his secret to success at The World's Fastest Half-Mile. "To win at Bristol you have to have the perfect combination of being aggressive when it counts and getting in there and making an aggressive move and being patient and knowing when to lay up so you don't wreck," Keselowski said. "It's so easy to get in trouble at Bristol, you have to know where you are on the track at all times." 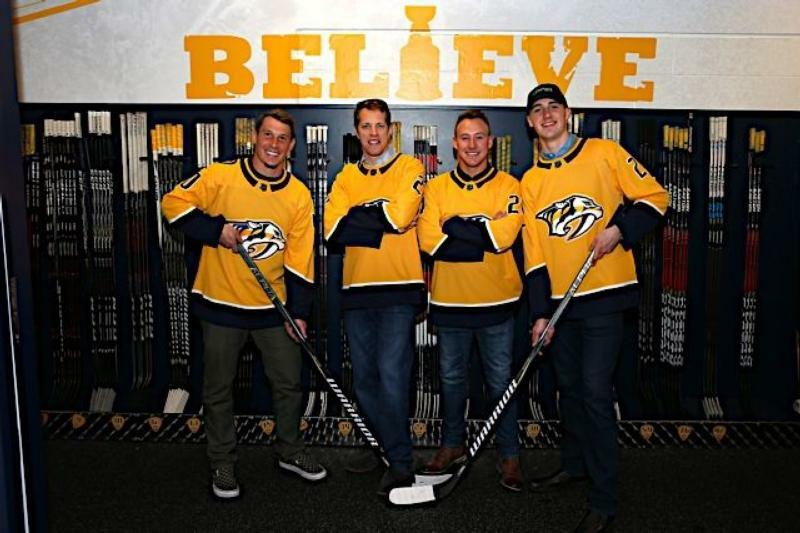 Following the game the drivers toured the Predators locker room, where they met with Predators players Mike Fisher, Roman Josi, Kyle Turris and Ryan Ellis. In addition to watching Keselowski, Hemric, Cindric, Finchum and the rest of the best racers in NASCAR mix it up on the track, a ticket to the Food City 500 weekend will allow fans to take advantage of so many fun activities to make a complete weekend of family fun, including great video entertainment provided by Colossus TV, the world's largest center-hung video screen, premium VIP experiences like the Chairman's Experience, tailgating, on-site camping, concerts, great food and beverages in the concession stands throughout the property, and so much more. And for families who want to bring the entire clan, Bristol Motor Speedway officials are making it easier than ever for kids to have an awesome experience. Kids' tickets (12 and under) are free and adult tickets are $5 for Friday's (April 13) Bush's Beans Pole Day. On Saturday (April 14), kids' tickets are free and adult tickets start at $30 for the Fitzgerald Glider Kits 300 NASCAR XFINITY Series race and the Zombie Auto 150 NASCAR K&N Series event. On Sunday (April 15) adult tickets start at $60 for the Food City 500 and kids' tickets are $10. Be sure to buy your tickets before April 1 when prices will increase. For all races, each child must have a physical ticket in hand to enter the gates. The Bristol Motor Speedway ticket office is the only authorized location that can produce the free kids' tickets.